In 1943 a group of corrosion engineers working in the pipeline industry formed the National Association of Corrosion Engineers with the goal of "protecting people, assets, and the environment from corrosion”. In the 1960s, they commenced development of control standards to define appropriate materials for a wide variety of corrosive applications, including oil and gas production and refinery facilities. In 1993, the organization was renamed “NACE International”. Today, NACE offers over 150 standards that address metal corrosion in a vast number of applications ranging from exposed metal structures to corrosion resistant coatings on railroad cars. The following NACE Measuring Pressure of Sour Gas and Crude White Paper (courtesy of Ashcroft) discusses NACE standards that specifically address corrosion resulting from expo- sure to sour gas or sour crude. You can download the entire NACE Standards Sour Gas and Crude White Paper here, or review it in the embedded document below. For more information, contact Mead O'Brien at (800) 892-2769 or visit their web site at https://meadobrien.com. 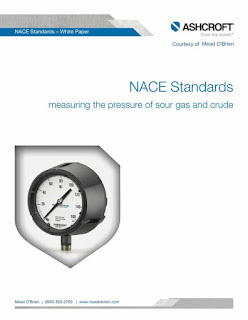 NACE Standards - Measuring the Pressure of Sour Gas and Crude from Mead O'Brien, Inc.